I held the warm coffee mug, cradling it with both hands as I stared out the window, thoughts swirling where they shouldn’t go. Deep thoughts of anxiety and fear had no place in my mind that was learning to yield to the transformational renewing of Christ, but days like today I succumbed to the invisible crooked finger beckoning me to come and dwell in misery. So, without a thought of Jesus and His unfailing love, I stood at the window cradling a warm coffee mug and let my thoughts have their way. My gaze landed on the grape arbor standing alongside our home. Winter’s barrenness clung to the ancient vine. Russet brown tendrils wove in and out of the supportive frame, tangled and wrestling for a spot to grip their bare fingers. I thought of my life that, lately, had seemed barren and tangled as I gripped my bare fingers around the foundation I had worked hard to build. My foundation stood, but did I have the strength to continue gripping while all around me lay shards of a broken life? 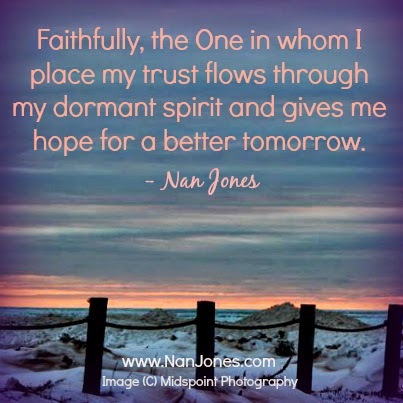 Would the One in whom I placed my trust flow through my dormant spirit and bring new life? A flash of dusty blue motion caught my attention. It stopped at the far end of the grape arbor. Could it really be a bluebird? No. Surely not. But then a brighter cobalt blue darted toward the birdhouse on the arbor’s post. He poked his head into the circular opening, turning his head back and forth. His dusty blue mate joined him, taking her spot on the perch and looking inside. The birds took turns hopping from the perch to the roof and back to the perch again. O Lord, You really do love me with a tenderness that takes my breath away! Thank you. Thank you for the hope of new life among the barren, russet browns of this winter season. All of creation sings Your praise and declares Your glory. I, too, will sing praise to Your Name. Color me with joy as I find my way through this barren landscape. Flow through my dormant spirit and bring new life. And as if this wasn’t a strong enough message of God’s love, He had another gift of hope for me. There on the side of a stump made planter gripped a red-headed woodpecker! I felt tickled to no end. God in His infinite goodness knew how to make me smile. Within minutes of my discovery, the birds were gone. The One in whom I placed my trust flowed through my dormant spirit and gave me hope for a better tomorrow. “Sing, O heavens! Be joyful, O earth! Would you like to be a guest blogger on Morning Glory? I’m looking for those who would like to share how you found God in your darkest moments. Contact me at nan@jubilantlight.com and I’ll send you the guidelines. I look forward to hearing from you. If you received Morning Glory via email, please visit the Morning Glory page to worship along with David Crowder as he sings, “Oh How He Loves Us.” What a wonder it is to spend a few moments offering praise to the Lord. PreviousFinding God’s Presence ~ Who Am I? NextFinding God’s Presence ~ How Does God Become Everything I Need? Scriptures of Encouragement ~ Will God Find Me Faithful? Only Jesus can change the landscape of our broken hearts and restore them agan, as He most certainly is Doing For your life Nan. Thank you Jesus for putting a smile on Nan's face through the beauty of the beautiful birds you sent to brighten her heart and for song you continue to sing over her. Thank thank you Nan For sharing. Nan, I LOVE how you write….you bring words to life. I am not a particularly visual person in that I instantly get visual images from words but I did with this wonderful blog. Keep writing, girlfriend. Share the wonder and the gift that is Jesus. Judy, I'm so glad you stopped by. Thank you. And thank you for your kind words. I hope you're doing well. Thank you for your kind, encouraging words. God is so faithful to His children. His love amazes me. I'm so glad you stopped by.